Come fall in love with Cave Hill! 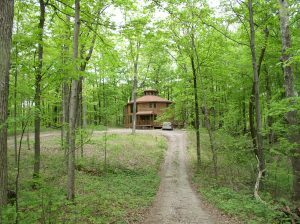 Located in Adams County in Southwestern Ohio, Cave Hill Cabin is just a quick 1 hour drive from Cincinnati. Located at the end of a private half mile gravel drive, the property sits on the top of Cave Hill, an outlier of cliff sandstone that survived glaciation and is more than 700 feet above low water at Cincinnati. Cave Hill is also the home to Cave Hill Cave, the westernmost known cave in Adams County. You will love the openness of space in our secluded woodland getaway, but most of all, you will fall in love with the peace and quiet. Removed from the hectic pace of daily life, it is the perfect retreat for anyone seeking a private getaway. Whether you are a writer in need of a quiet place to work, a family looking for some quality time, or a group of friends wanting to reconnect, you will find what you are looking for here. The land is magnificent in all seasons. Even in winter, you can see the land clearly and the sweep of rock ledge – part of the limestone layer of the whole county. 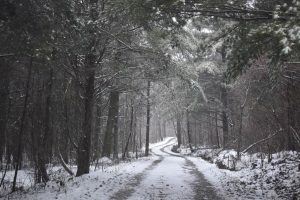 Winter also brings tracks of deer, foxes, turkeys, and birds. Spring trillium are abundant, summer brings lazy days among the ferns and high sky looking to the Appalachian foothills, and fall is superb with views of changing colors and cooler weather, perfect for roasting marshmallows around the fire pit. Relax in the house, walk the trail, explore the cave, rest in the quiet enjoyment of the foothills of the Appalachian Mountains.